I have been contacted by Dianne Lindesay who works on the team that makes the "Descent From Disaster" series. She says, "I’m hoping you may be able to assist me with research I am doing for a documentary about the Lockheed Electra Plane Crash on Mt Ruapehu in 1948. The documentary will form one episode in the seven-part series ‘Descent from Disaster’ which screens on TV One. The reason I’m contacting you is that the RNZAF played a key role in the search process at the time. I have the names of many of those who were involved, but not all. Given that the accident happened 67 years ago I realise my chance of finding any of these men still alive is probably relatively slim but I think it’s worth a shot. I’m keen to get word out to the RNZAF community to see if there’s anyone out there who may have had some involvement in this disaster. Or even, if there is a family member who may have knowledge of the role their relative played at the time, that could be useful as well." Can anyone here assist Dianne? Dave , there would be Roy Montrowe and Reg Dear both serving with NAC at the time and still with us. Both had pretty strong opinions ( in private ) about the cause. OK. I will let Dianne know, although it is the RNZAF members she has asked to locate. Flying Officer David W Gray – we know he is deceased and my colleague is in touch with his family. Given the number of RNZAF men involved there will be others who took part whose names are not on this list. As mentioned, we’d be interested in hearing from anyone who had any involvement in the Ruapehu Air Disaster – or any family member of a person who was involved. the following expansion of names and bio details may be of assistance. GRAY, Flight Lieutenant David William, AE.Z411351 & 70155; Born Dannevirke, 2 Apr 1922; RNZAF 27 Jul 1941 to 31 Mar 1950, TAF 16 Dec 1953, Res. 1 Aug 1957 to 31 Jul 1974; Wireless Operator-Air Gunner, then Air Signals. Air Efficiency Award - 16 Aug 1960. Following training in Canada Flt Lt Gray briefly served with 8 Sqn RCAF (Bolingbroke) at Sea Island near Vancouver, Mar-May 1942. After returning to NZ he served with 5 Sqn RNZAF (Vincent) in Fiji, then 7 Sqn RNZAF (Vincent) at Waipapakauri. In 1944 he flew a tour of 31 missions in the Solomons with 25 Sqn RNZAF (Dauntless). SIEGERT, Air Vice-Marshal Cyril Laurence, CB, CBE, MVO, DFC, AFC. NZ421779 & B70105; Born Fairlie, 14 Mar 1923; RNZAF 8 Mar 1942 to 16 Nov 1979; Pilot. Chief of Air Staff Oct 1976 to Oct 1979. Citation Distinguished Flying Cross (Imm) (21 Nov 1944): [190 Sqn RAF (Stirling)] Flying Officer Siegert has proved himself a most capable pilot and captain of aircraft. He took part in the liberation of Normandy and the airborne operations in Holland. During a recent daylight sortie his aircraft was damaged by intense anti-aircraft fire, in the face of which he completed his mission successfully. On the homeward flight, the aircraft was attacked simultaneously by two Focke Wulf fighters, one of which did further damage. The other was probably shot down by the rear gunner. During a total of four attacks, the aircraft was still being engaged by the ground defences. Despite this, by superb handling of his aircraft, Flying Officer Siegert was able to ward off the enemy and make a safe return to base. Citation Air Force Cross (NY1954): [40 Sqn RNZAF (Hastings)] Not available - for distinguished service as a captain of transport aircraft over a number of years but particularly for his part in the RNZAF entry in the 1953 London-Christchurch Air Race. Member of the Royal Victorian Order (25 Feb 1954): For service to H.M. The Queen, as Captain of the Queen’s aircraft, during the 1954 Royal Tour of New Zealand. Citation Commander of the Most Excellent Order of the British Empire (QB1975): Not available. Awarded for distinguished service as Chief of Staff ANZUK Forces, Singapore, and DCAS, RNZAF Headquarters. Citation Companion of the Most Honourable Order of the Bath (NY1979): Not available. Awarded for distinguished service as CAS. During WWII served with 299 and 190 Sqns RAF (both Stirling). No 190 Sqn was a special duties squadron employed on secret missions over France, Holland and Norway and in direct support of the Allied armies in the field. Fg Off Siegert took part in the towing of gliders during the D-Day landings at Normandy, the first paratroop drops at Arnhem and the subsequent airborne support of the besieged garrison. From 1945 to 1947 he was seconded to BOAC flying Dakotas to West Africa and Cairo. In 1949 he was attached to 24 (Commonwealth) Sqn RAF, taking part in the Berlin airlift. CO 3 Sqn RNZAF (Sioux/Iroquois/Wasp/Bristol Freighter) Jan 1966-Nov 1966. KEAN, Wing Commander Roy Champion, mid. NZ1084; Born Wellington, 20 Oct 1890; British Army (5th South Lancashire, Regt) c.Aug 1915 to 20 Jun 1916, RFC/RAF 21 Jun 1916 to 11 Jun 1919, 3689; RNZAF 24 Apr 1941 to 17 Sep 1947; Pilot, then Engineer. Later Wg Cdr R C Kean, mid, AMIMechE, AFRAeS, MIEI. Chief Inspector of Air Accidents, Air Department, until 1955. Citation Mention in Despatches (29 Aug 1919): In recognition of valuable services rendered in connection with the war while serving at the Aeroplane Experimental Station, RAF Martlesham Heath, Mar 1918-Jun 1919. Wg Cdr Kean’s RNZAF service was mainly as Director of Aeronautical Production. Died Wellington, 26 Oct 1958. JACOBSEN, Squadron Leader Alan Frederick, AFC. NZ41113 & 70123; Born Canterbury, 17 Feb 1914; RNZAF 5 Jan 1941 to 24 Sep 1962; Wireless Operator, then Navigator/Wireless. Citation Air Force Cross (NY1946): For the past two years this officer, as Signals Leader at the School of Navigation and Reconnaissance, has brought to his duties, in the air and on the ground, unbounded energy and enthusiasm. Retained in New Zealand for medical reasons following operational service in the Pacific, he has set an outstanding example in unfailing devotion to duty. He is credited with contributing in no small degree to the low accident rate at the school, and has not only given his operators endless tuition and excellent instruction, but has also kept the most minute check on their work, thus obtaining an extremely high standard of operating ability. This officer’s conduct throughout has been in accordance with the highest traditions of the Service. He has flown 1,733 hours, including 143 in the last six months. Took part in the Dakota survey flight to Japan, Mar 1946; Mosquito ferry duties in 1947-1948, followed by the appointment of Signals Leader 75 Sqn RNZAF (Mosquito) 1948 and to the Berlin Airlift in 1949. Died Canada, c.Jun 1976, whilst serving as a Trade Commissioner with the NZ Department of Trade and Industry. HARDY, Wing Commander Jack, OBE, mid. NZ36119 & 70202; Born Wellington, 20 Jan 1912; RNZAF 4 Nov 1936 to 23 Apr 1963; Engineer. Citation Mention in Despatches (22 Mar 1946): In recognition of gallant services rendered during the war. From Jun 1944 to Jul 1945 served as Station Engineering Officer, Lauthala Bay; Engineer Officer, HQ Guadalcanal; CO Field Maintenance Unit, Bougainville. Citation Officer of the Most Excellent Order of the British Empire (NY1961): Not available. In the years immediately preceding this award Wg Cdr Hardy served as CO RNZAF Woodbourne; OC Engine Repair Squadron, 1 Repair Depot; 1951-1954 on exchange with the RAF; OC 1 TTS then OC Technical Wing, Wigram. His outstanding service in these appointments was recognised by the award of the OBE. BAIGENT, Wing Commander Cyril Henry, DSO, DFC*, AFC. NZ411973 & 70038; Born Ashburton 16 Jan 1923; RNZAF 23 Mar 1941 to (das) 10 Nov 1953; Pilot. Hon Aide-de-Camp to HE the Governor-General 17 Jun 1946 to 1 Apr 1947. Citation Distinguished Flying Cross (3 Nov 1942): [15 Sqn RAF (Stirling)] This officer, who has completed many sorties has invariably displayed the greatest determination to complete his allotted task successfully. During an operation against a target in Bremen, he flew over the area for a considerable time to identify his objective before releasing his bombs. Although his aircraft was severely damaged by anti-aircraft fire, he flew it back to this country and effected a masterly emergency landing. Flight Lieutenant Baigent has set a fine example of courage and devotion to duty. Flt Lt Baigent took part in the first and second ‘1000’ bomber raids on Cologne on the night of 31 May-1 Jun 1942, and Essen on the night of 1/2 Jun 1942. Citation Companion of the Distinguished Service Order (17 Jul 1945): [75(NZ)Sqn RAF (Lancaster)] Throughout three tours of operational duty this officer has displayed conspicuous gallantry and exceptional determination. Since the award of a Bar to the Distinguished Flying Cross, he has taken part in many attacks against important and heavily defended targets. Both in the air and on the ground, Wing Commander Baigent has proved to be an able, keen and courageous leader, who has invariably set an inspiring example to all under his command. In Jan 1945 Sqn Ldr Baigent was promoted to Wg Cdr and took over command of 75 Sqn. At the age of 22 he was the youngest squadron commander in Bomber Command. Citation Air Force Cross (NY1948): [75 Sqn RNZAF (Mosquito)] This officer was posted to No 75 Squadron as a Flight Commander in October, 1946, for Mosquito ferry training duties. Early this year  he proceeded to the United Kingdom and delivered his first Mosquito to New Zealand. Since then this officer has delivered two more aircraft from the United Kingdom. Furthermore he has assumed command of the Squadron and despite the time occupied in flying, he has completed much valuable work in New Zealand, the United Kingdom and on the ferry route to make this difficult task of ferrying easier and more practical. By his example of keenness and fine leadership he has maintained a high morale amongst aircrew of his Squadron and his never failing enthusiasm and energy have made him an outstanding figure and he has won the admiration and respect of all ranks. Squadron Leader Baigent has now completed 1,572 hours flying of which 279 hours have been flown within the past six months. CO 75(NZ)Sqn RAF (Lancaster) Jan-Sep 1945. CO 75 Sqn RNZAF (Mosquito) Jul 1947-Jan 1950. Died Palmerston North, 10 Nov 1953. McDOWELL, Air Commodore John James, MBE. NZ539021 & H70043; Born Redcliffs, Christchurch, 27 Sep 1917; NZ Army/TF 3 yrs; TAF 5 Oct 1938 to 3 Sep 1939, RNZAF 4 Sep 1939 to 1 Apr 1973; Wireless Operator-Air Gunner, Navigator, then Pilot. Queen’s Honorary Aide-de-Camp 1 Jan 1969 to 1 Apr 1973. Citation Member of the Most Excellent Order of the British Empire (KB1943): [3 Sqn RNZAF (Hudson)] Flying Officer McDowell joined the Christchurch Territorial Squadron on 21st April, 1938 [sic], and was mobilised on the outbreak of war. He was one of the earliest aircrew to qualify as an Air Observer and as a result of his capabilities and personal qualifications was commissioned on 30th November, 1940, in No 1 G.R. Squadron. On 16th February, 1942, Flying Officer McDowell was posted as an Air Observer to No 7 G.R. Squadron, Waipapakauri, and on arrival was made Squadron Navigation Officer. His natural ability as a navigation instructor and his enthusiasm and knowledge produced excellent results amongst the aircrew of No 7 G.R. Squadron, several of whom have done exceptionally good work in the South Pacific Area. Since his appointment as Navigation Officer to No 3 B.R. Squadron on 21st October, 1942, Flying Officer McDowell has shown outstanding ability and zeal in the performance of his duties both in the air and on the ground. His qualifications and experience have been invaluable to the remainder of the aircrew and his untiring efforts in respect of their instruction and supervision have been largely responsible for a high standard of proficiency amongst the air observers and wireless operator air gunners of this unit. During his tour of duty at Guadalcanal Flying Officer McDowell assumed the additional role of Squadron Meteorological Officer for a period, in the absence of Flight Lieutenant Gabites, with marked success. As a result of his ability in this direction the U.S. Air Authorities requested that he make special night forecasts which were used exclusively by them in determining the advisability of despatching their aircraft on night bombing missions. WEBBY, Squadron Leader Gordon Alan Lee, MBE, DFC, (pff). NZ404558 & 70057; Born Wanganui, 2 Oct 1919; RNZAF 23 Nov 1940 to 8 May 1953, Res. to 14 Jan 1965; Navigator, Navigator/Wireless Operator. Citation Distinguished Flying Cross (18 Sep 1945): [139(PFF)Sqn RAF (Mosquito)] Flight Lieutenant Webby, as Navigator, has completed numerous operations against the enemy, in the course of which he has invariably displayed the utmost fortitude, courage and devotion to duty. Citation Member of the Most Excellent Order of the British Empire (KB1951): Not available. Following the completion of his navigation training in Canada, Sqn Ldr Webby served with RAF Ferry Command flying the Atlantic between Canada, Bermuda, South America and the UK. Later he flew with 511 Sqn of RAF Transport Command between the UK and India. Very early in his flying career, immediately following his training in Canada and with less than 100 hours flying experience in his log book, Gordon Webby was detailed to navigate a Hudson across the North Atlantic to Britain. On 3 Aug 1941, at 1230 hours, when passing over New Brunswick his aircraft crashed and the two others on board were killed. The aircraft crashed near Moncton and Gordon Webby, with multiple broken bones and a severely lacerated face and scalp, was transferred to a hospital where he was assessed as having a low life expectancy. He gradually recovered, however, but it was not for some weeks and after much complaint of pain, that it was discovered that he also had a broken neck. 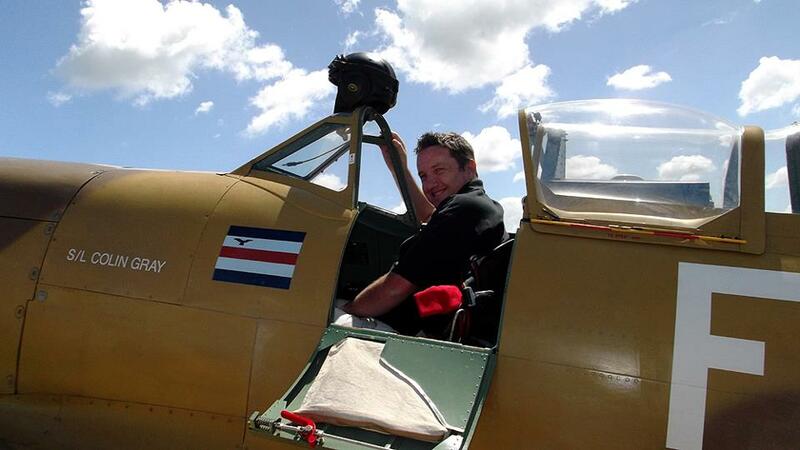 On recovery he resumed his flying career, including numerous trips to Berlin with the Pathfinder Force. On return to NZ in Jul 1945, having completed 1,500 hours with Transport Command and at least 63 sorties with the Pathfinder Force, he joined 41 Sqn RNZAF (Dakota) and later took part in the ferry of three Mosquitoes from the UK to NZ. He then served with 75 Sqn RNZAF (Mosquito), and as Station Operations Officer and Flying Wing Executive Officer at Ohakea. His dedicated service was recognised by the award of the MBE. Gordon Webby was one of the genuine ‘characters’ of the RNZAF, without whom the Service is the poorer. Died Taupo, 14 Jan 1965. ORMEROD, Squadron Leader Charles Fray, DFC, mid. NZ413340 & 70068; Born Gisborne, 23 Dec 1920; RNZAF 14 Jun 1941 to 18 Aug 1949, Res. to 1 Sep 1957; Navigator. Citation Distinguished Flying Cross (9 Jun 1943): [75(NZ)Sqn RAF (Stirling)] An excellent navigator, Flying Officer Ormerod has completed a large number of operational sorties. Always cheerful and willing to undertake any task, he has set a splendid example of courage and energy to all ranks in his squadron. He has participated in raids against the most heavily defended towns in Germany. Completed two tours of duty with 75 Sqn. Citation Mention in Despatches (14 Jun 1945): For distinguished service and devotion to duty. At the time of this award Sqn Ldr Ormerod was serving as Station Navigation and Operations Officer at Mepal - the base of 75(NZ)Sqn. In the immediate post-war period, on secondment from the RNZAF, he flew with BOAC for a year on the London-Singapore route, joining 41 Sqn RNZAF (Dakota) on return to NZ. Station Navigation Officer, Whenuapai, 1947-1949. All except Dwyer (same as Dwyer, E J in White Pages?) appear to be deceased. Death dates can be narrowed down to day/month by searching further on the New Zealand BDM site, but takes more time than I have to spare.